The Grammys Really Wanted Us To Know They Support Women! Last year, the Grammys came under fire for giving almost all the awards presented during its telecast to men — a controversy that Grammys president Neil Portnow inflamed when he said women needed to “step up” in order to correct the industry’s gender imbalance. (Portnow will end his tenure this year.) The gaff hovered like a specter over the evening’s proceedings, which made an obvious effort to put women front and center. At times it more than paid off: Janelle Monáe offered a slick, magnetic performance of the Prince-inspired bop “Make Me Feel,” Brandi Carlile seemed to ascend to another plane during a mighty rendition of her ballad “The Joke” and Yolanda Adams, Fantasia and Andra Day blew the roof off with an Aretha Franklin tribute. (There were so many significant women performing, I hardly missed what I'm sure would have been a great show from Ariana Grande. The singer got in a public dispute with the Grammys producer Ken Ehrlich, saying he was stifling her artistic choices, and pulled out of a planned performance at the ceremony even as she picked up her first ever Grammy.) 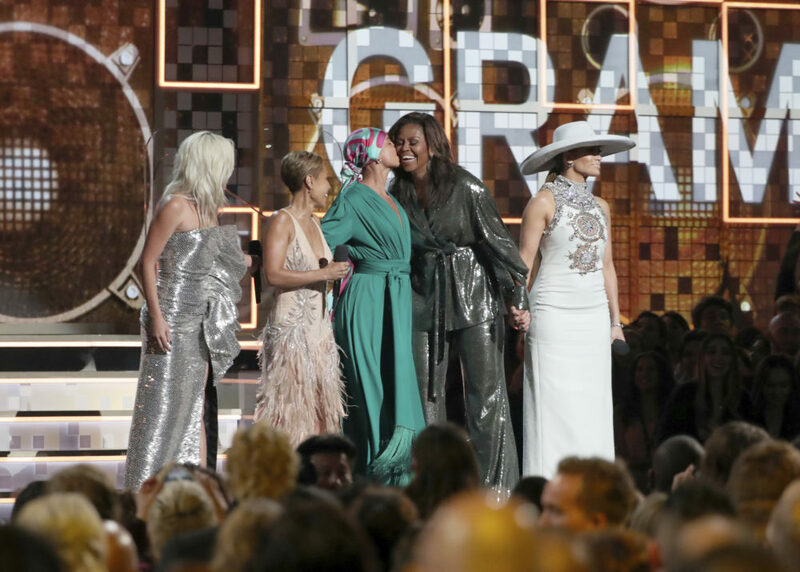 But a stilted intro by Grammys host Alicia Keys, with Michelle Obama, Jennifer Lopez, Lady Gaga and Jada Pinkett Smith came off as back-patting, and overt references to the Academy’s diversity and and inclusion initiative felt crass. When Dua Lipa remarked, during her acceptance speech for Best New Artist, “I guess this year we really stepped up,” it was clear Portnow and Co. weren’t off the hook. When Cardi B unleashed a scorching rendition of her song “Money,” decked out in leopard print tights and a giant peacock tail, it was clear the ceremony had reached its zenith. (Though she was very nearly upstaged in a striking intro by the pianist Chloe Flower.) Ever since Cardi B broke out in June 2017 with the ubiquitous “Bodak Yellow,” she has been on a mission to prove she is more than a social-media-sensation-turned-one-hit-wonder. 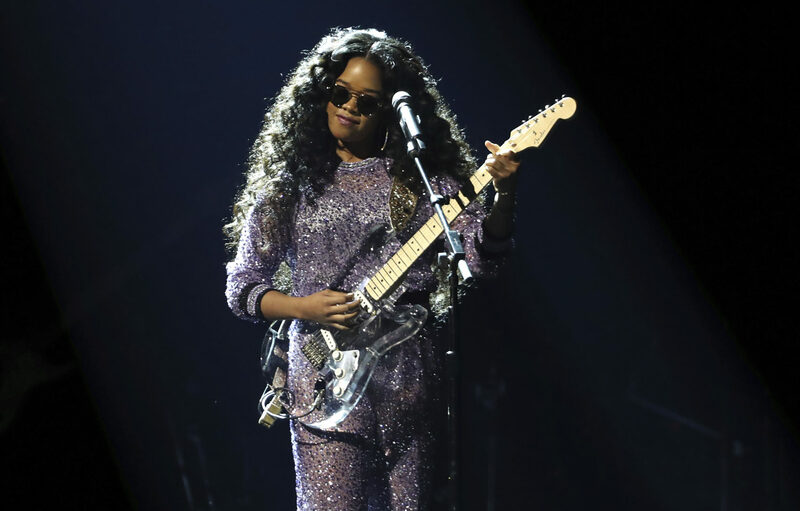 The rapper's 2018 album “Invasion of Privacy” went a long way toward affirming her artistic bona fides, and her performance at the Grammys seemed to seal the deal. To cap it all off, she took home Best Rap Album, making her the first female solo artist in history to do so. Hip-hop managed to break into the song and record of the year categories for the first time in history — an embarrassing milestone for the Grammys, which have always been slow to recognize the genre. (This year also saw the expansion of the general fields from five nominees to eight, a reflection of the Academy's effort to diversify the major categories.) When Drake took the stage to accept his award for Best Rap Song, he couldn’t resist making a few digs at the Academy for being biased and out-of-touch. 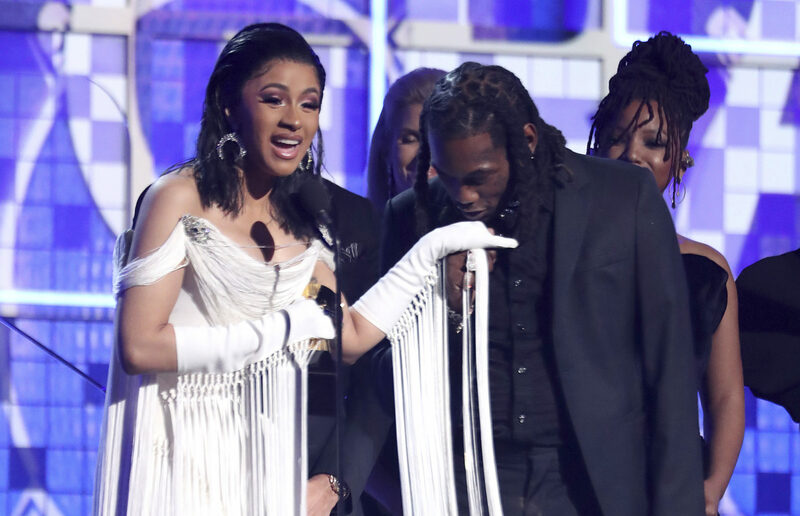 The rapper has declined to attend the ceremony in the past, and this year hip-hop heavyweights Kendrick Lamar and Childish Gambino were pointedly absent. So it was bittersweet, not to mention awkward, when Childish Gambino won both Song and Record of the Year for “This Is America” — and wasn’t even present to accept the awards. 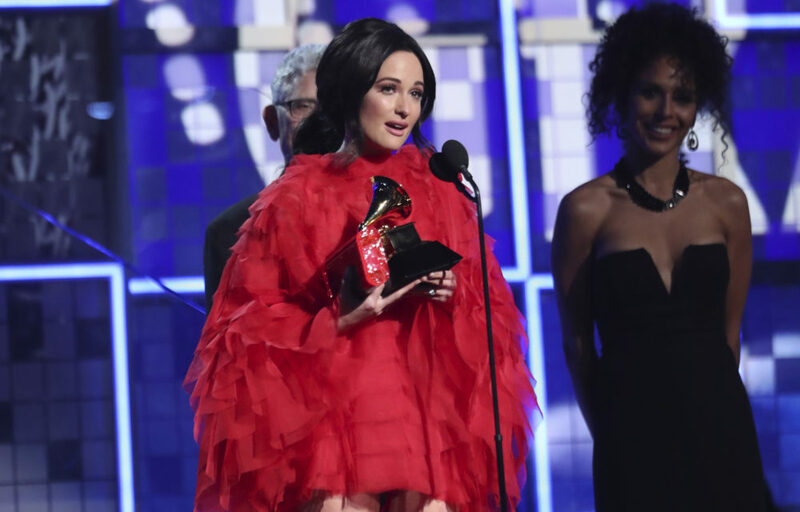 There was no clear frontrunner in the Best Album competition, but Kacey Musgraves was hardly the betting favorite, and the singer seemed just as baffled as the rest of us to be taking home the prize. Her album “Golden Hour” beat out critically-acclaimed and popular efforts by Cardi B, Kendrick Lamar and Janelle Monáe, among others. Musgraves’ win seemed to confirm the Academy’s stodginess and echo its historical reluctance to recognize hip-hop and artists of color more generally. Pitted against a number of musically progressive, hip-hop-inflected albums, “Golden Hour” looked like a safe choice — which was disappointing, since Musgraves is actually a bit of a maverick in the context of country music, chafing against the genre’s conservatism in deliciously witty songs. Sometimes, with all the politics roiling beneath the surface of the awards, it’s easy to forget why they exist in the first place. Several performances by newcomers to the Grammys stage helped put the focus back where it should be: on the music. Watching the emergent pop artist H.E.R. shred on guitar, the young R&B duo Chloe X Halle sing in enchanting tandem and the relative veteran Brandi Carlile bring down the house, I couldn’t help but feel the future of popular music was in good hands. 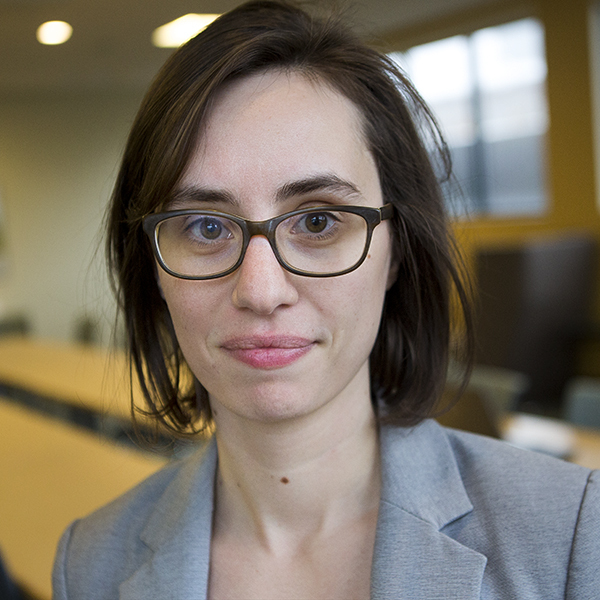 Disappointing as it was that Berklee College of Music faculty member Tia Fuller failed to take home Best Jazz Instrumental Album, the Boston Symphony Orchestra represented with two wins for its recording of Dmitri Shostakovich's Symphonies Nos. 4 and 11.